Tuesday 8 April 2003 was a dark day in Iraq for the many journalists who wanted to ensure that coverage from Baghdad would continue to reach the outside world. Most journalists presumed they were relatively safe in their temporary offices at the Palestine hotel. They were wrong. 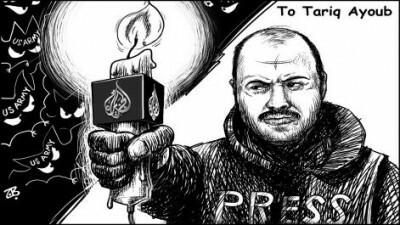 Tuesday’s first victim was Tareq Ayyoub, a 34-year-old Jordanian reporting for al-Jazeera. Ayoub and his cameraman Zuheir Iraqi were wounded when US missiles struck al-Jazeera’s office in Baghdad, less than a mile from the Palestine hotel. Ayyoub died shortly after in hospital. Nearby, coalition artillery battered the Baghdad office of Abu Dhabi television, trapping more than 25 reporters who phoned for help from the basement. When a US A10 “tank killer” plane fired a missile at al-Jazeera’s office in Baghdad, the pilot circled the building and fired another missile, apparently making sure the hit was a success. What a perfectly strange coincidence that the US had also “mistakenly” bombed the al-Jazeera press office in Kabul during the Afghan action. Hours later, it was the turn of the Palestine hotel, the home for some 300 non-embedded journalists. The 15th floor of the hotel was hit by a US tank shell, which struck the offices of the Reuters wire service. Reuters cameraman Taras Protsyuk, 35, and Spanish cameraman Jose Couso, 37, were killed. A Japanese cameraman working for Fuji TV, three other Reuters journalists and another Western reporter were also injured. At Central Command Headquarters in Doha, Vincent Brooks, a US general, tried to deny that coalition forces were intentionally targeting journalists. But journalists in Baghdad did not agree. Many felt they had become targets. “We cannot guarantee the safety of reporters unless they are with us,” a US army spokesperson stated. This statement made it very clear that reporters outside the wing of the US forces were now military targets. Farewell freedom of the press. Farewell international law guaranteeing security and safety of reporters in war zones. Farewell truth. Reuters’ editor-in-chief, Geert Linneban, said that the shelling of the Palestine hotel “raises questions about the judgment of the advancing US troops who have known all along that this hotel is the main base for almost all foreign journalists in Baghdad”. According to veteran BBC war correspondent, Kate Adie, the US defence department threatened to target the satellite uplink positions of independent journalists in Iraq. Also according to Adie, the US attitude was “entirely hostile to the free spread of information”. She warned that the Pentagon was vetting journalists according to their stance on the war and intended to take control of US journalists’ satellite equipment in order to control access to the airwaves. Aridi reminded that the then US secretary of state, Colin Powell, called on journalists to leave Baghdad before the war started “so that no witness remains to testify about the committed massacres”. Martin Bell, a former BBC correspondent, said: “I think it’s very worrying that independent witnessing of war is becoming increasingly dangerous and this may be the end of it. Those words were prophetic. Between the invasion of 20 March and the events on 8 April, 16 media professionals were killed in Iraq. Jose Couso, Tele Cinco cameraman; Taras Protsyuk, Reuters cameraman; Tareq Ayyoub, al-Jazeera reporter; Julio Anguita Parrado, reporter for Spanish newspaper El Mundo; Christian Liebig, journalist for German Focus magazine; Terry Lloyd, ITN correspondent; Paul Moran, freelance Australian cameraman; Kaveh Golestan, freelance BBC cameraman; Michael Kelly, US journalist and Washington Post columnist; Kamaran Abdurazaq Muhamed, BBC translator; Gaby Rado, Channel 4 News foreign affairs correspondent; David Bloom, NBC TV correspondent; Veronica Cabrera, Argentinian freelance journalist; Frederic Nerac, French journalist who went missing; Hussein Othman, ITN correspondent; unknown translator, working for Malaysian journalists. The US occupation of Iraq turned out to be the deadliest conflict for journalists in history. By the end of 2014, 422 had died in Iraq, according to the BRussells Tribunal database, among them 391 Iraqis. In 2014, Iraq was yet again the deadliest place on earth for media professionals, as was the case in 2003, 2004, 2005, 2006, 2007, 2008, 2010, 2011 and 2013. Added to this tragedy is the total impunity. In its annual Global Impunity Index, the Committee for the Protection of Journalists, CPJ, spotlights countries where journalists are murdered and the killers go free. There have been attempts to hold US soldiers accountable. 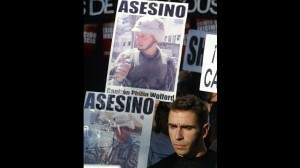 Following the death of the Spanish cameraman Jose Couso, there were protests in front of the US diplomatic posts in Spain and several civil and judicial actions in order to determine the liability of the people involved. Up to now, there are still concentrations of people demanding justice on the 8th of each month in front of the US embassy in Madrid. 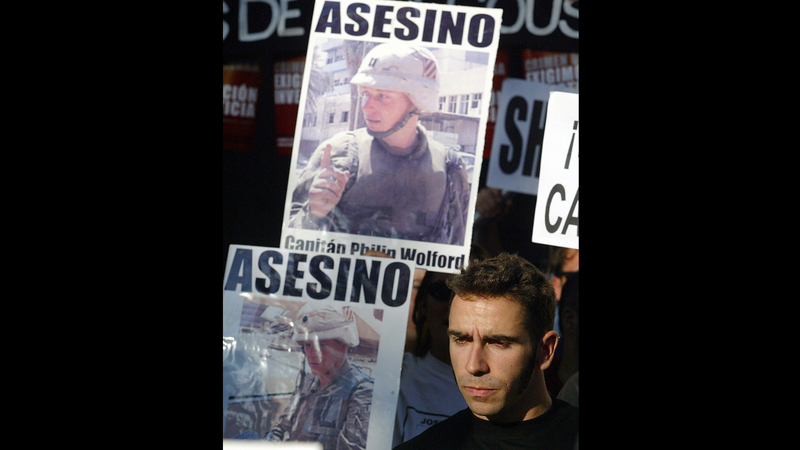 On 29 July 2010, Santiago Pedraz, a Spanish judge, issued search and arrest warrants against the three US soldiers, but they have never been detained. Dima Tareq Tahboub, Ayyoub’s widow, continues her mourning for her late husband, which she said has been compunded by the lack of justice. “No justice has been achieved to this day after 10 years,” she told al-Jazeera in 2013.Tahboub has filed lawsuits in Belgium, the US and Jordan, but “none of the cases were successful and the American lawyer finally informed us that US soldiers were granted immunity from prosecution”. This is unacceptable for a country that likes to call itself ‘the greatest democracy on earth’. “The recent war in Iraq is a perfect illustration of the growing risks faced by journalists working in conflict zones. It is therefore important to call renewed attention to the fact that attacks against journalists and media equipment are illegal under international humanitarian law, which protects civilian persons and objects, as long as they are not making an effective contribution to military action. “The media cannot be considered a legitimate target, even if they are being used for propaganda purposes, unless they are being exploited to instigate grave breaches of humanitarian law.